Nissan Leaf electric vehicles will be tested for use as taxicabs in New York City for about six months from July, a Nissan official said Tuesday. The feasibility study using six Leafs comes as the automaker was recently chosen to supply the city with 13,000 next-generation taxis starting next year to replace existing cabs under a 10-year contract. 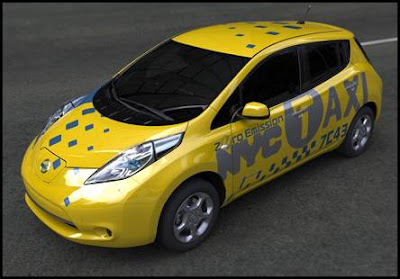 "If (the test) is successful, then obviously there is a possibility that a small part of the mix of the fleet of New York taxis could become EVs," Nissan Executive Vice President Andy Palmer told reporters in Yokohama. Nissan is to provide NV200 minivans with 2-liter gasoline engines to the Big Apple for use as taxis starting in October 2013. The vehicle features sliding doors and a sunroof and is more fuel-efficient than the existing taxis, according to the automaker.